After reading Margo’s Magnificent Choice and decorating our Tacky Box (did you miss my first Tacky Box Review? ), it was time to put the story to action. Read about how we implemented what we learned while using our Tacky Box, then, scroll down to enter to win a set for yourself! You might be thinking my daughter, at two and a half, is too young to participate in this activity. I’d be inclined to agree, but what better way to teach, even someone so young, than to practice the very things we wish them to learn? Yes, Tacky Box is geared to children older than my own, but that doesn’t mean we can’t use it for any age. What I learned through the use of the Tacky Box is that I have a tangible way to show my daughter how to stop using words and phrases we shouldn’t use. That meant, I was practicing for all of us. We did write the two major words that I have issues with her using (“mine” and “no”) and we’ve been working on more polite ways to express ourselves. I chose to remove my words … I’ve got a few expletives that I’ve needed help removing from my vocabulary when I get aggravated, but showing those wouldn’t quite be appropriate here. While I still have a hard time completely removing them, it’s important to note that the book and box come to mind when I use these words that I had committed to putting away. I think that says something about the effect the book can have on all age groups. My daughter still needs reminding, but I’m glad that this book has given me a good way to deal with it when she’s able to grasp the concept more fully. I expect to read Margo’s Magnificent Choice quite a bit in the next couple years and am certain this will give our family a positive way to deal with bad words and phrases if that time comes. With Tacky Box, I won’t be unprepared! How will you handle your child(ren)’s tacky behavior? 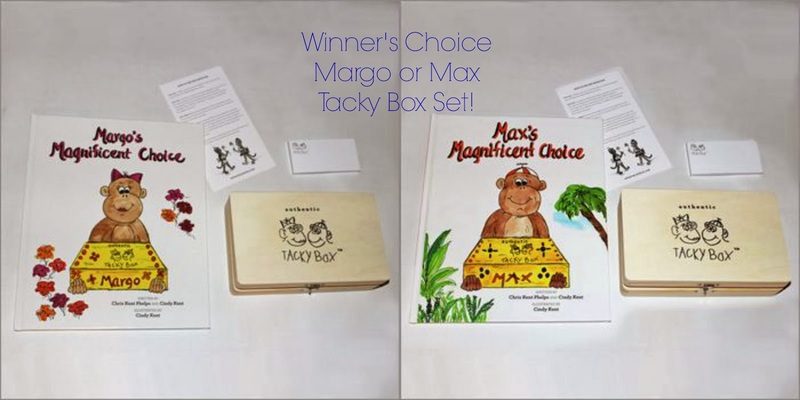 1 lucky reader will win a Tacky Box set in their choice of Margo (girl) or Max (boy). This giveaway begins on 2/5/14 at 12:00 a.m. EST and ends 2/24/14 at 12:00 a.m. EST.